Traning-wise I was happy though a little underdone. I knew I'd be good until around 8 miles, and then the last couple were going to hurt. My plan was to run the first 10km in 32:45 and then hang on. My best times on this course were all negative splits and the way the breeze was blowing today it was going to be a tough first few miles, with a friendlier run home. That worked well for me. After the first mile it was starting to get a bit tougher and you could certainly notice the breeze. Mick was already a good way up the road and I'd opened up a decent gap. I knew if I could run a solid first few miles it was going to get easier. The course is tough but fair - a few drags here and there where I really focused on keeping my cadence high and I knew from my km splits that my time was okay. It was a shade over 6kms to go and I knew if I could hold 3:20/km pace I had a new PB. That's pretty much what happened - I was on the km countdown and my splits were all good. If I ran a slow one the next one would bounce back to get me back on track. Just before 8 miles we took another right turn and this is the twisty part of the course - a small country lane. No support whatsoever down there and I was glad to take a left hand turn back onto the main road and I got a good lift from the supporters on that last mile and a half stretch back up to the finish. I was still feeling okay and I really attacked and lifted the pace and felt very strong right up to the finish line where I recorded a new PB of 52:41 for second place. That's 5:16/mile pace or 3:16/km pace so a very solid race. 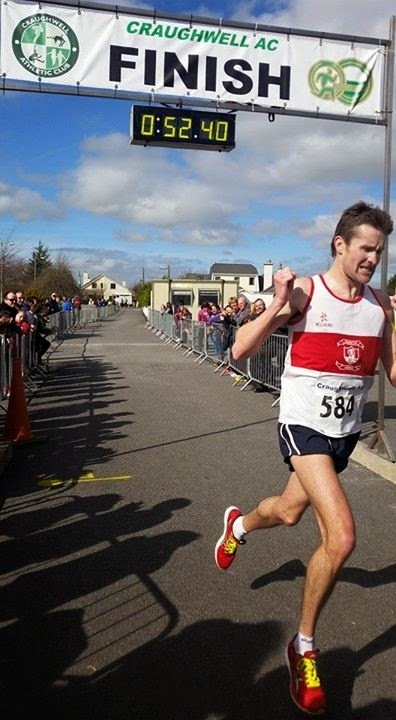 Well done to Mick who won in classy 49:29 (on tired marathon training legs). He'll have a super run in Rotterdam in 3 weeks time when he freshens up. The Raheny lads then filled up the next 4 spots and then a few more familiar local faces started to filter through the finish. All in all a great day and I was delighted how I ran as I felt in control the whole way. 3:04 / 3:19 / 3:25 / 3:18 / 3:19 / 3:26 / 3:13 / 3:18 (8km in 26:22) / 3:09 / 3:10 (10km in 32:41) / 3:22 / 3:14 / 3:14 / 3:17 / 3:24 / 3:08 (16km in 52:19 - second 8km in 25:57) / 0:22. Finish 52:41. Yes, congrats on the new PB. Congratulations Matt. Great run for a PB on your own. Great run for a man of your vintage Matt ;-) , superb.